Well, I'm deviating here. This isn't a plate post but a leather set. A few weeks back a guildie from Throned got The First Satyr's Spaulders off of Xavius in Emerald Nightmare. 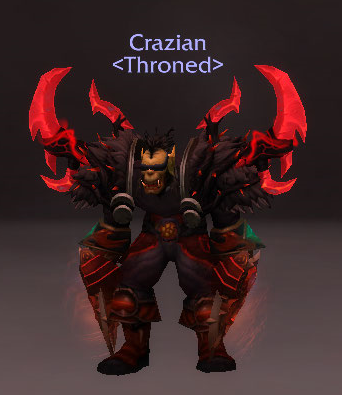 Crazain is an orc Monk, not a Demon Hunter. Here's the transmog Crazian is wearing. Since an orc is wearing these shoulders, not an elf, you really, really see them! 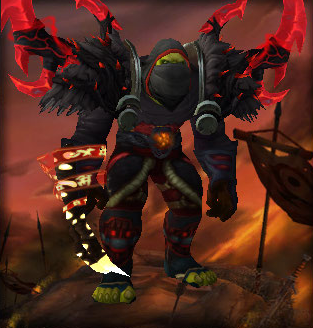 A couple other guildies made jokes about transmogging them and I thought, "Those are some wicked shoulders!" so I put together a set. I put together two sets. 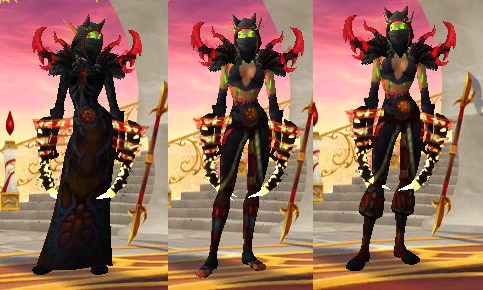 Both sets use armor from multiple expansions. I tried to keep both sets with a dark and glowy red visual to match tainted Xavius look. 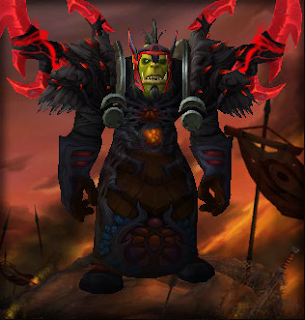 I found this robe that just looked awesome and gives an almost warlock look. The first set is the regular tunic chest piece and the boots have open toes. I personally try to avoid open toes on boots but felt the glowy red skull look on the shafts outweighed the toes. With the robe, closed toes are a must! The green toes sticking out from under the hem black robe are just distracting. However the boots, for all that they are covered up, do also match the set very well. They're shown on the last Blood Elf Female in the bottom set of pictures. A couple of these items take a bit to get. Some are simple farm the mobs, check the AH do the quest items. The quest Vile Idolatry for the crown takes a bit more than just doing it. You need to do a bunch of the opening quests in Burning Crusade: Hellfire Peninsula in order to open up the Mag'har faction for Horde to get the questline in Garadar in Nagrand. It starts with Farseer Korhuk who gives a three step questline. Once you've completed that you'll be able to get the quest Vile Idolatry from Farseer Kurkush. You can also get a fun bandit looking helm, Clefthood Hide Mask while doing the questline for the Mag'har. It's easier the Alliance, you need to farm a bit of Kurenai rep in order to talk to the NPC in Telar. No specific questlines. BEFORE you start any of this, make sure you're on a leather wearer who can use intellect AND that you have that spec selected for loot choice. The questing system auto selects your quest reward now. You do not get to choose between the rewards. If going questing for the Scout's Hood make sure you have an agility spec selected for loot. The belt is a Legion legendary. Good luck getting a drop. Legion legendaries have a "random" drop rate and come from "random" sources in the Broken Isles. Basically, the more things you kill in the Broken Isles, the more chances you get for a legendary drop. They can drop off mobs or be contained in chests. The more you kill, the more you chances for getting one increase. However you can't pick which one will drop next. Some legendaries only drop for certain classes and specs. Thank goodness this belt will drop for any leather wearer, regardless of spec or class. We all know not all races are created equal. Or for that matter are the sexes. This set looks a wee bit different on a wee bit sized Blood Elf. And well...that chest? On a female? Significantly skimpier. There are quite a few other pieces that can mix and match very well with these pieces. I'd love to know you mogged your shoulders with!